So delightfully fresh, so deceptively strong - Salute! 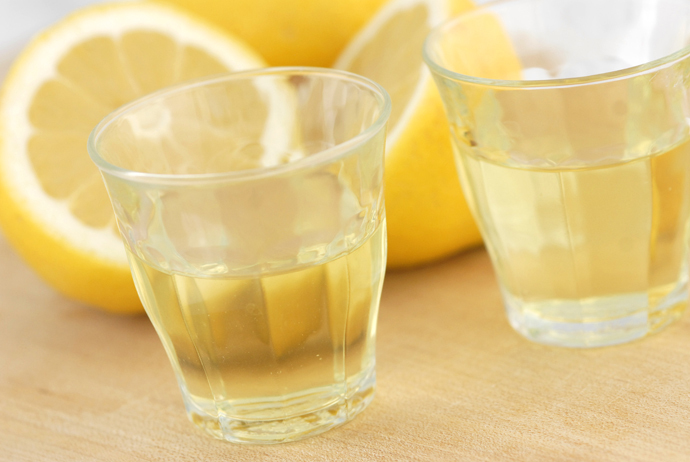 ‘Limoncello-ians’ all have their special spin on how to make the best concoction, but this particular version is comparatively quick and straight forward – still very buonissimo! Pour eight cups of good vodka into a 16 cup capacity container with tight fitting lid. Peel the rind from approximately 6 lemons, taking care not to include the white ‘pithy’ part of the fruit (pith is very bitter) – a vegetable peeler may work best. Once you have peeled 1 cup of rind, plop them into your container of vodka. Give the container a swirl or two and place the lid on the top. Keep this mixture out of direct light and in a cool place (basement like – not fridge like). Do not open the lid during the 2 weeks so the fermentation is faster and more consistent. Once your 2 weeks are up, remove all the rind and loose bits from the container using a long fork or pigtail (or strain through a cheesecloth). Make a simple syrup using a 1:1 ratio for a sweet mix or a 1:2 mix for less sweet (our preference). For a 1:2 mix, pour 3 cups of white granulated sugar into a pot and and add 6 cups of water. On medium heat dissolve the sugar completely. Let cool and add the sugar water to your vodka mix. Stir to combine and chill in the freezer for about an hour. Serve in small chilled glasses. Delizioso! A friendly word of caution: You can quickly go from sipping judiciously while chatting politely to singing ‘That’s Amore’ at the top of your lungs while your hosts drag you to the door. This entry was posted in beverages, recipes and tagged alcohol, beverage, cooking, drink, fast, fresh, fruit, healthy, italian, party, quick, recipe, refreshing, side, summer by MixedSoup. Bookmark the permalink.